There are plenty of things computer drum machines / groove workstations can do to show off. There are plenty of long feature lists they might add. But actually coming up with something you can play? That’s what can really make music better in the studio and live. And that’s why Maschine 2.2 is a welcome update. First off, let’s admit something. Amidst all the clever functionality with grid-based controllers, there’s something that remains useful about a big, 4×4 grid of pads and MPC-style workflows for certain kinds of music. Those bigger targets don’t require a lot of accuracy, and it’s easy to keep mental track of where things are when your brain has just a 16-pad grid to track. But above and beyond that, it’s quick access to sample editing, repeated notes, mute, and other functions that make these fun to use. You can very simply improvise basic rhythmic patterns. 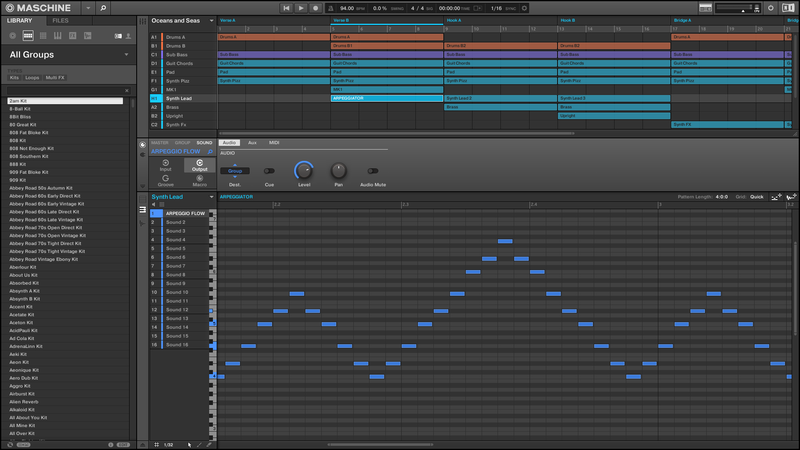 It’s something Maschine has harnessed really well. So, whether you choose this alone or as a complement to other playing methods, it’s great when it really works. It can keep you musically productive. And it’s no accident that you keep hearing Maschine over and over again for that reason. But while the concept was great, 1.x was a bit uneven in use. Maschine 2 brought a much-needed overhaul to the software under the hood, added lovely drum synths, cleaned up the UI, and vastly improved performance (once some drum synth issues were addressed with an update, and 2.1 added a nice shaker and a new “Grit” kick). Maschine was a full reboot of the platform, but we haven’t yet seen NI really get to build on that foundation; the basic workflow was the same. 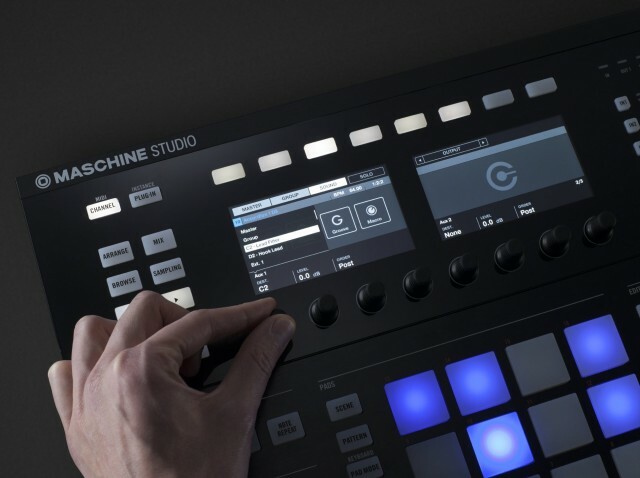 With Maschine 2.2, Native Instruments takes the first steps that could impact how you play. It sounds like simple stuff, but having access to an enhanced arpeggiator, scales, and chords can mean much easier playability on the drum pads, without having to add a keyboard. Okay, now, NI are keen to sell you a keyboard, as you may have heard. (See my hands-on with the much-ballyhooed keyboard.) And there’s now more integration between their Kontrol S-series keyboards and Maschine, as a selling point: not only can you use its encoders for control, but the lights above the keyboard follow along as you play. I’m a keyboardist, so of course I like the idea of playing a keyboard. But even as a keyboardist, part of what Maschine 2.2 allows is for you to leave the keyboard at home – any keyboard, NI-manufactured or otherwise. Adding an arpeggiator to a keyboard is nothing new, nor are chord modes. And confining a black-and-white keyboard to a scale is, frankly, a little weird – it’s not the most logical layout for a non-keyboardist, and it’s counter-intuitive for a keyboardist. On a grid, though, it’s great, as we saw with controllers like Push. And on a 4×4 grid, it’s downright essential, because a chromatic layout just doesn’t cover it when you only have 16 pads. The integration with hardware here makes loads of sense, including directional arpeggiator controls right on the hardware, and the ability to record everything into patterns. Back at the studio, I’m definitely going to try out the keyboard integration; it might finally make me use the S-25 more heavily. Then again, buying a new keyboard really isn’t for everyone, and Maschine’s hardware already gives you great browse and parameter control functionality. But this may be the first 4×4 pad I can play melodically without wincing. And that’s a big deal. Am I alone on this, or are some of you Maschine users feeling the same way? Let us know in comments. By the way, the biggest news here if you’re a 1.x user and have waited to upgrade is, the upgrade is now $49.50 / 49,50 €. If you were waiting, now’s the time: the bugs are ironed out, and the added playability is huge. You’re getting a bunch of entirely new instruments in the deal, too, so I can endorse the price without hesitation. There’s still more I want to see from NI: Audiobus support in iMaschine and easier cross-platform mobile/desktop workflows, and real-time time stretching in desktop spring to mind, among others. And please, Note Repeat is ripe for more improvements. (If it can be triggered on an offset, even better – given that even the simplest techno has beats on alternating rhythms, let alone all the rest of music, why are things like this so rare?) But I have to go play with these play modes for a while. Addendum: Yes, hopefully some of you already figured out how to add arps to Maschine already, as below – hat tip to Moon Wheel / Olle, incidentally one of my favorite electronic musician friends. But it is awfully nice having integration on that screen. MaxMSP MIDI arpeggiator used with Native Instruments’ Maschine from Olle Holmberg on Vimeo. The arpeggiator (correctly) records into patterns, so you can more easily use it as a way of generating ideas. 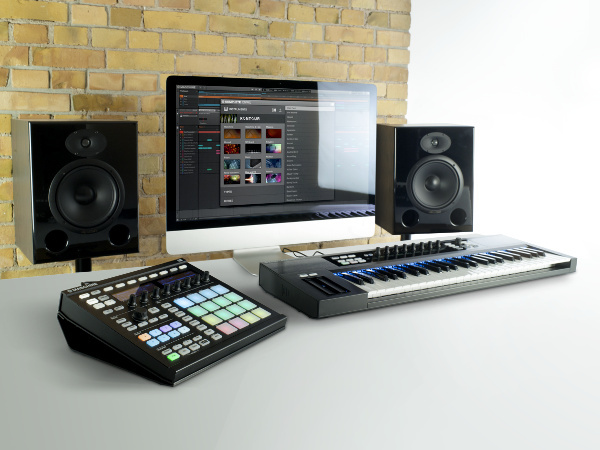 Maschine Studio’s knobs and display now do more.